Staff Photo by Dan Henry / The Chattanooga Times Free Press- 6/16/16. Test drive of the Cadillac XT5. The mid-size luxury crossover segment is one of the most fiercely competitive — and lucrative — in the automotive marketplace. To go up against the likes of the BMW X5, Volvo XC90 and the Lexus RX 350 takes value, exceptional content and top-shelf design. 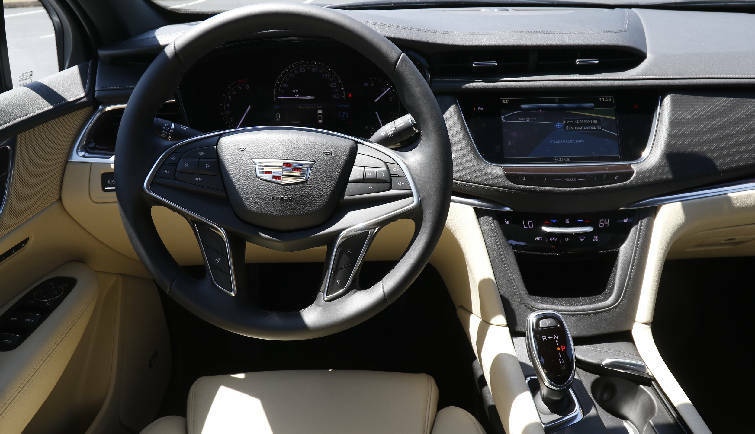 GM offers all three of those virtues in its new Cadillac XT5, which is assembled in nearby Spring Hill, Tenn., formerly home of GM's defunct Saturn brand. The XT5 is a five-passenger luxury SUV that replaces Cadillac's previous mid-size crossover, the SRX, the brand's best selling vehicle. As you might guess, Cadillac designers have taken extra care to upgrade the vehicle in order to keep — and even increase — market share. Bryan House, sales manager at Integrity Buick GMC Cadillac on International Drive, says his dealership has about a dozen XT5s in stock. Early reviews from customers are extremely positive, he says, and a special unveiling last week at the dealership drew an enthusiastic response from Caddy owners. Pricing for the XT5 starts at $38,995. Our tester, a two-wheel-drive model in Luxury trim, has a sticker price of $47,910. All-wheel-drive models are available for about $2,500 more. The XT5's design includes an inviting new face with jewel-like headlamps that frame the corners of the crossover. Side panels are sleek and elegant and the rear quarter is neatly rounded. Overall, the XT5 brings to mind a finely tailored garment, as opposed to the old design, which had a more generic, off-the-rack look. The design is more unified than before, with shorter overhangs, front and rear. Our tester is shown in luminescent Crystal White tricoat, a classy color that compliments the elegance of the design. 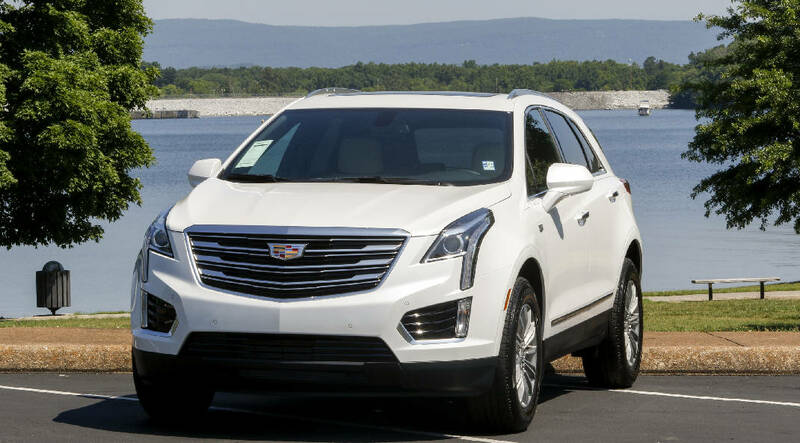 (To our eye, white and black are the XT5s most flattering colors, as they highlight the vehicle's formal lines.) The vertical light clusters, front and rear, are part of the design signature of modern Cadillacs. Small details, like the "Cadillac" script in the pin-striping, show a level of attention that will help the XT5 compete with BMW and Lexus, at home and abroad. In fact, the new XT5 may come to be one of Tennessee's most important automotive exports. The rear hatch opens to reveal 30 cubic feet of storage space behind the second-row seats. With those seats folded, the cargo area expands to 63 cubic feet. The second row seats slide forward and rearward to create more legroom, or more cargo space, depending on a family's needs. By expanding the wheelbase, Cadillac has added about three inches of knee room to the back seats. The cabin of the XT5 makes generous use of high-quality materials. The Sahara Beige leather is attractive, and the seats are comfortable and supportive. Fit and finish are Lexus quality. The dash has a clean design that eliminates bulky buttons and switches. Gauges are easy to read and contain no over-the-top theatrics. An 8-inch color display showcases navigation, phone and music functions. Overall, we found the cabin of the XT5 to be a comfortable place to spend time. The crossover includes such luxury touches as a heated steering wheel, remote start, XM radio, and a wireless charging station for your smartphone. A $1,025 tech package adds navigation, Apple's Carplay interface and an upgraded Bose stereo system with 14 speakers. Handsome 18-inch wheels allow for beefier Michelin tires. The tall sidewalls improve the ride quality of the XT5 and avoid the harshness of lower-profile rubber. The XT5 is powered by a 3.6-liter V-6 engine that makes 310 horsepower. Equipped with a tow package it can pull up to 3,500 pounds. The engine is mated to an eight-speed automatic transmission, which is controlled by an electronic shifter in the center stack similar to those in BMWs. In a mid-day test drive, we found the XT5 to be a willing playmate, carving up back roads with an aggressiveness not often seen in an SUV. The ride is taut, dare we say almost European. Cadillac has invested heavily in recent years in developing world-class power-trains and suspensions, and it shows in the XT5. The XT5 is 300 pounds lighter than the SRX, which makes for more nimble handling. Direct injection improves throttle response in the V-6. We might spring for the all-wheel-drive option for mountain driving. The XT5 carries a four-year, 50,000-mile, bumper-to-bumper warranty. The crossover gets 27 mpg highway and 19 mpg city. It has all the qualities to remain Cadillac's best-seller, while attracting new customers with its blend of refinement and driving aplomb.